In 2016, Tufts University’s President Anthony Monaco signed the Second Nature Climate Commitment on behalf of the university. The Commitment integrates two critical components of climate leadership: carbon neutrality and climate resilience. One stipulation of the Commitment is for the university to complete a campus-community resilience assessment. While climate change mitigation strategies aimed to reduce carbon emissions are often emphasized, it is equally important to consider how communities can plan for the predicted impacts of climate change. In addition, due to recent events such as Tropical Storm Irene and Sandy, there is a heightened sense of urgency within our local and regional communities to increase resilience and adapt to extreme weather events. 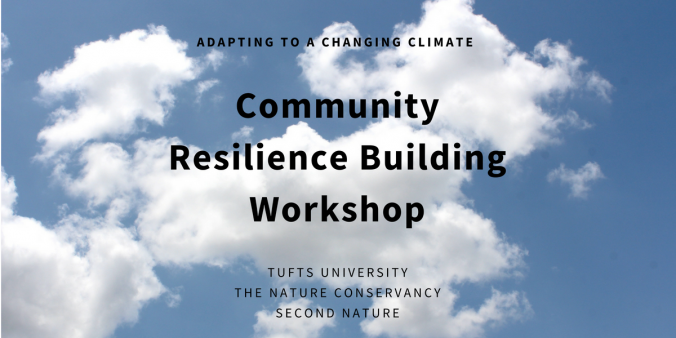 In order to advance the Climate Commitment goals and address concerns that the Tufts community has regarding natural and climate-related hazards, Tufts University hosted a Community Resilience Building Workshop for the Medford/Somerville campus. The workshop took place on May 3rd, and was facilitated by The Nature Conservancy. Community Resilience Building workshops help municipalities and institutions create an opportunity for their community to to gather and plan proactively for potential emergencies. This is an important step towards climate adaptation and community capacity-building to deal with a changing climate. The Tufts University Core Team that helped prepare for and organize this workshop included Tina Woolston from the Office of Sustainability, Geoff Bartlett and Matt Hart from the Department of Public and Environmental Safety Emergency Management Unit, as well as two Tufts students, Emma Conroy and Sophie Lehrenbaum. 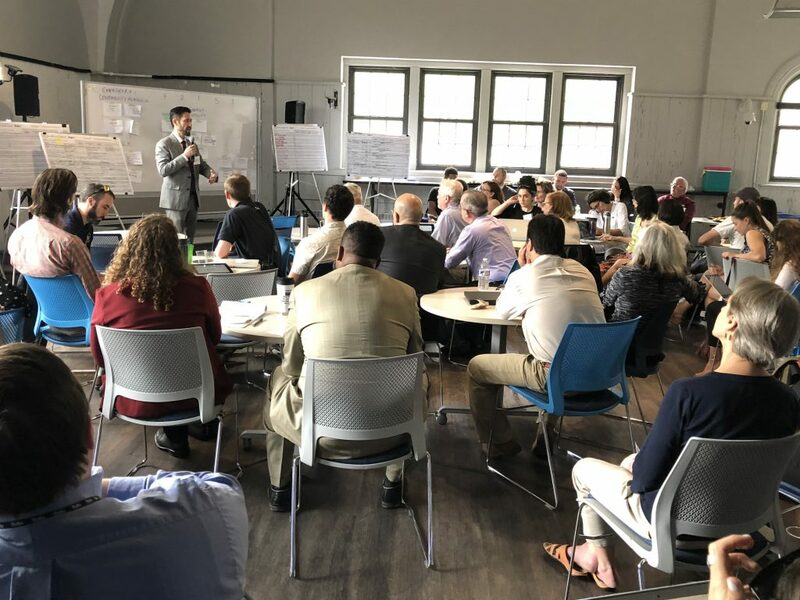 Around 60 Tufts and surrounding community members attended the workshop, including representatives from various Tufts groups such as Facilities, Finance, Health Services, Construction, Public and Environmental Health and Safety, as well as undergraduate and graduate students. In addition, representatives from the City of Medford’s Office of Energy and Environment and Office of Public Health, the City of Somerville’s Office of Sustainability and Environment, and the Massachusetts Emergency Management Agency were also present. The full day event started with an overview of climate change impacts in the Northeast, the top 4 potential climate related hazards as identified during a recent Threat and Hazard Identification and Risk Assessment undertaken by the Department of Public and Environmental Health and Safety, and an introduction to the resources that would be discussed during the next portion of the event. These resources included maps of the campus, the existing hazard mitigation plan, information on the number of days over 90 degrees and flooding, as well as maps depicting natural disasters that have affected the area. Attendees were then broken up into five groups, and through a facilitated process, discussed the existing vulnerabilities and strengths of the campus, and prioritized concrete actions that could be taken. 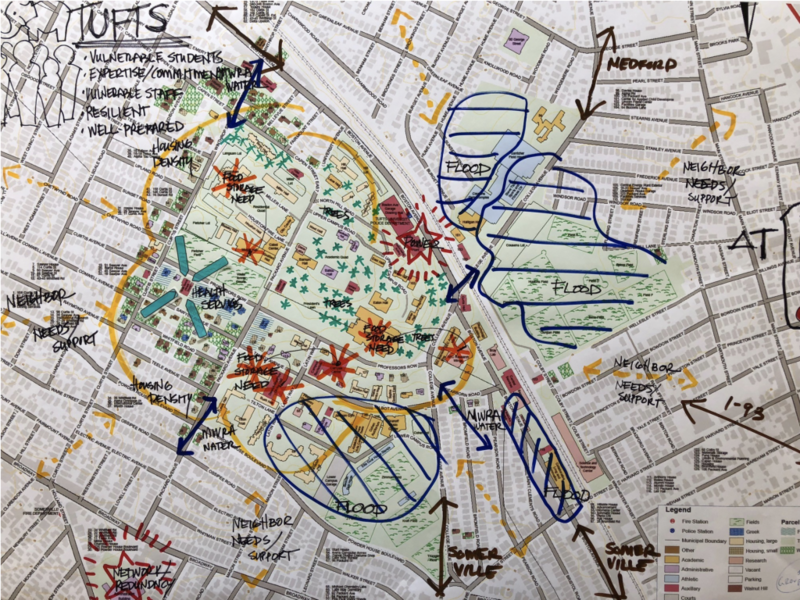 As a part of this process, each group illustrated where they thought vulnerable areas and potential hazards were located on top of a base map of the university. 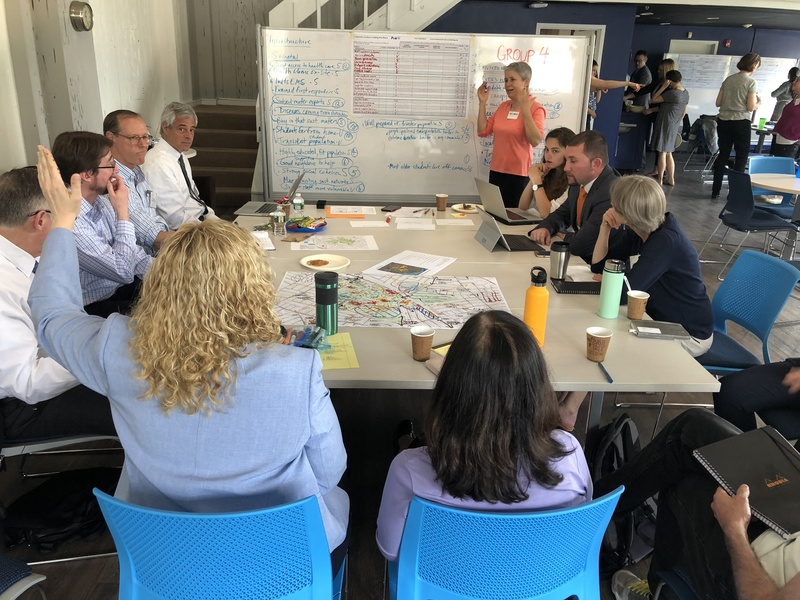 While all groups recognized that Tufts, along with its host cities, already has many strengths and assets that will help in emergency situations, many recommendations were made on how Tufts could better prepare for such events through longer term, comprehensive planning. Community-based actions towards adapting to the predicted impacts of climate change can lead to planning and preparation that meets the specific needs of the community and the local landscape. In addition, it helps empower community members to take charge and prepare for some of the climate-related challenges we currently face as a society that may not be within our individual control to avoid. Similar Community Resilience Building Workshops will be coming to the Boston and Grafton campuses soon, stay tuned!